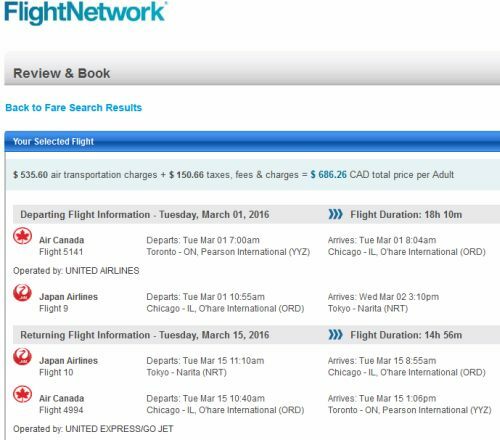 There's a new record for the cheapest roundtrip flights between Toronto and Japan, set at $676 CAD roundtrip including taxes. The flights are using a combination of Air Canada (domestically) and Japan Airlines (for the international leg of the journey). Note: These are also showing up on ITravel2000 for $697 to $700 CAD. Try this direct search link, and click on 'Edit Your Search' in the top right corner to try different dates. 2. Adjust the currency in the top right corner of Flight Network from USD to CAD. Click on the departure date box to open up the calendar view to quickly browse different date combinations. Look for the date combinations that show up around $722 CAD for Tokyo and $728-$731 CAD for Osaka. Plug these dates into your Flight Network search. UPDATE #1 @ 5:20 PM EST : It's possible to get these for as low as $647 CAD roundtrip including taxes. The record continues to fall. 2. Make sure the currency is set to CAD in the top right corner (it will be, if you used the link above). Search for a flight from Toronto to Tokyo or Osaka - using the same dates from the examples above. 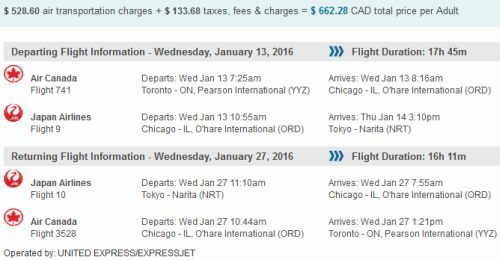 The prices should show up as $662 CAD roundtrip including taxes for Tokyo. Osaka will be $677. 3. Click through from Fly.com to Flight Network (right beside the green 'Go to Site' buttons). 4. Apply the $15 off Flight Network promo code, which is DZZ15 (see instructions above for how to apply the promo code) - which will bring it down from $662 to $647. Not every date combination seems to work. Some jump up from the $600s to $1000+ when you get to Flight Network. Just follow the instructions from Update #1 above, but use Nagoya, Japan (NGO). Where to stay in Osaka, Kyoto, or Tokyo ? The following AirBNB links will lead you to some great deals on places to stay in Osaka, Kyoto, or Tokyo for under $79 CAD/night for 2 people. toronto, yyz, flight deals, air canada, asia, tokyo, japan, nrt, east asia, hnd, japan airlines, osaka, kix, kyoto, itm, nagoya and ngo. 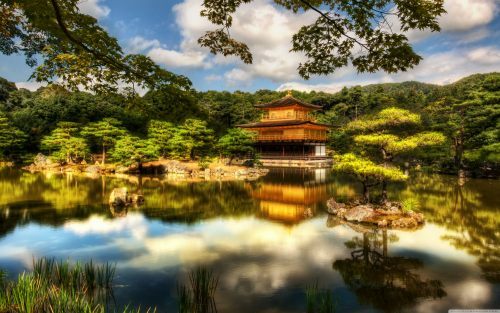 7 Responses to "Toronto to Tokyo or Osaka-Kyoto, Japan - $676 CAD roundtrip including taxes | new record!" Doesn't seem to work for any dates in April... does it? Looking to fly out sometime in April, after the 4th. Great find! Similar to the above comment, looking for something April / May. It doesn't appear these cheaper rates apply to direct flights i.e. ~13 hrs. Thanks for posting! Booked for $684/pps in February! Please let us know more of Japan deals! Missed out on this one!